Aquatech is perfectly located for exploring fresh water caverns, called cenotes. These cenotes are located in the jungle and are owned by private land owners. 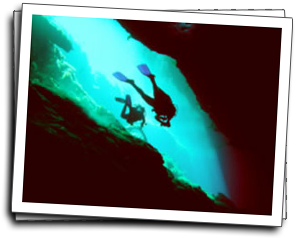 If you are a certified open water diver, you can tour these caverns with our professional guide. Each tour group will have no more than 4 divers. Wearing normal open water dive gear, certified divers can explore these cavern zones within sight of daylight or air overhead and see the most beautiful stalactite and stalagmites decorations up close. If you are already a certified cavern diver, come dive the incredible cenotes near Aquatech. Cavern diving tours include: Transportation to and from dive sites, weights, tanks, dive light, and professional guide and refreshments. Dive site fees are paid to the land owner and are not included in our rates. 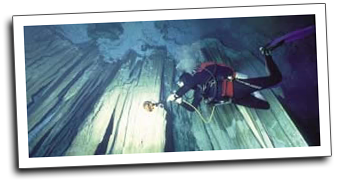 Cavern diving is diving the "overhead environment" staying within the sight of natural daylight or air overhead.. This course is very popular and provides the diver an orientation to the specialized needs of the cenotes. Emphasis is placed on dive planning, air management, buoyancy control, using a guide reel and line, emergency procedures, swimming techniques and teamwork. This is not a cave diving course in any sense but allows the recreational diver to experience the overhead environment and learn important diving skills that are essential for safe cavern and cave diving. The cavern course involves six hours of theory including land drills, accident analysis, the environment, "stress" management, and equipment configuration. This introductory course can inspire an interest to go beyond the cavern zone and advance to the next level of training, the “Intro to Cave” course. Some dive sites used for cavern instruction are: Cenote Carwash, Cenote PonDeRosa, Cenote Temple of Doom, Cenote Taj Mahal and The Gran Cenote and Dos Ojos. Course Length: 2 days, minimum 5 cavern dives/4 hours class time. All dive equipment is available for rent from Aquatech. * Please note: Dive site fees are additional and paid to the land owners.